The incredible legacy left by Yale University senior Mandi Schwartz will last a lifetime. And, really, that's precisely the way good friend and junior teammate Aleca Hughes would want it. On Sunday, a courageous Schwartz lost her two-year battle to acute myeloid leukemia in the presence of family and friends, including her mother Carol, father Rick, brothers Jaden and Rylan and her fiancé, Kaylem Prefontaine. Schwartz, who turned 23 in February, had been battling the dreadful disease since December 2008. The sister of Jaden, who was drafted by the St. Louis Blues in the first round in 2010, passed away at approximately 1:35 p.m. ET. "I think Mandi should be remembered as an incredibly kind and selfless person; an extraordinary hockey player and athlete who always put others before herself," Hughes told NHL.com Sunday night. "I think that was a huge part of her game while she was playing, and clearly it's going to be a huge part of her legacy long after this." Schwartz, of Wilcox, Sask., was first diagnosed with cancer just days after assisting the Yale women's hockey team to a 4-1 win over Brown during the first semester of her junior year with the Bulldogs. She'd undergo five rounds of chemotherapy and 130 days in the hospital in an attempt to put the cancer back in remission. 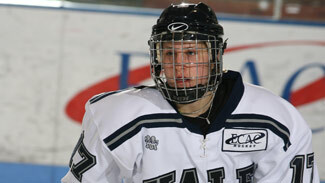 On Jan. 8, 2010, she returned to Yale for the spring semester and had every intention of rejoining the team for 2010-11. In April, however, she learned the cancer had returned. In mid-October, some four weeks after undergoing a 32-minute stem-cell transplant at the Fred Hutchinson Cancer Research Center in Seattle, tests indicated that the birth of a new immune system was under way. The Sept. 22 transplant utilized stem cells from two umbilical cord blood units donated anonymously to public cord blood banks. Unfortunately, only two months later, results of a biopsy indicated a relapse for a third time this year. Schwartz began playing hockey when she was 6, and was captain of the women's team at Athol Murray College of Notre Dame before attending Yale. "She's such an inspiration," Hughes admitted. "It's weird because people who read her story or heard her story are moved by it and those of us who were here with her and have watched over the years … it's been a journey and she's been the rock through it all. She's been the steady one, the optimistic one and because of that, she's taught us so much." Schwartz' ongoing battle with cancer inspired many, particularly Hughes, who was a finalist for the 2011 BNY Mellon Wealth Management Hockey Humanitarian Award. Hughes helped spearhead efforts to raise awareness for bone marrow and cord blood donors, in addition to raising funds for the Schwartz family. She organized a bone marrow donor drive and "Goals for Mandi" fundraiser during the Chowder Cup tournament in the summer of 2010 -- raising more than $5,800. She also helped organize the Nov. 12, 2010 "White Out for Mandi" fundraiser at Ingalls Rink, which raised over $15,500. "I think Mandi should be remembered as an incredibly kind and selfless person; an extraordinary hockey player and athlete who always put others before herself. I think that was a huge part of her game while she was playing, and clearly it's going to be a huge part of her legacy long after this." The two record-setting bone marrow donor drives at Yale added more than 1,600 potential donors to the National Marrow Donor Program's "Be The Match" registry. At least four genetic matches for patients in need of life-saving transplants have been identified through those drives. "We have another big drive on April 21 and we're in the process of starting a Foundation in Mandi's honor -- we talked to her about that and she was really excited about it," Hughes said. "I think there's so many things we were talking about when she was with us, and we're definitely incredibly motivated to build on them." When it became clear this past summer that Schwartz was in need of a stem cell transplant, Hughes set out to become part of a world-wide effort to raise awareness of the need for donors. The Schwartz story was featured on ESPN, ABC News and CBS News. "Mandi has changed my life in so many ways … so many unexpected ways," Hughes said. "For one, she brought me so close to God and I'm forever thankful for that. I think she's taught me the importance of helping others and giving back and just thinking about other people first. "There's always time, there's always energy to help someone else who's asking for it or not," she continued. "Every time I step out onto Ingalls Rink, I think of her and her passion for the game. I feel so grateful that our paths have crossed … it's hard to articulate." Jaden and his older brother, Rylan, were teammates at Colorado College this season. Jaden, a freshman, had a team-leading 30 assists and 47 points -- including 17 goals -- in 30 games this season. Rylan, a sophomore, was third on the team in scoring with 38 points, including 10 goals. Jaden was the leading scorer in the United States Hockey League with the Tri-City Storm in 2009-10, notching 83 points (33 goals) in 60 games. He became the youngest player to lead the league in scoring since 1982-83 and his output was the highest point total since Thomas Vanek in 2001-02. St. Louis Blues President John Davidson issued a statement on the passing of Mandi Schwartz earlier on Sunday. "From the entire St. Louis Blues organization, our thoughts and prayers are with the Schwartz family during this difficult time," he said.